Heidegger thought that all of Georg Trakl's poetry was really one long poem, and perhaps it could be said that all of his poetry takes place in one landscape, with its and silent woods and dark paths, barren fields and withered gardens. Sometimes Trakl is content to create a poem almost entirely out of such images in parataxis; at other times they form a setting for the lonely wanderers that drift through his world like the figures in a Munch painting. It is quite easy to give a sense of this composite landscape through a selection of quotes. What I have done here is extracted a series of single line descriptions, each from a different poem in his first book, Gedichte, which was published in July 1913, less than 18 months before Trakl's death. The translations are by Margitt Lehbert. From the earth decay is seeping. Flies are buzzing in yellow vapours. The reed’s small movement sinks and rises. Pitch-black skies of sheeted metal. The pond’s mirror loudly shatters. Through black branches, the toll of grievous bells. The tilled field shines white and cold. It is a stubble field on which a black rain falls. Ice-cold winds moan in the dark. An old man turns sadly in the wind. It is an empty boat that drifts down the black canal in the evening. The blackbird laments in leafless branches. 'In Autumn', 'Tranfigured Autumn', 'An Autumn Evening', 'Autumn Soul', 'Autumn of the Lonely One'... These poem titles show how Trakl's themes were suited to autumnal imagery, but he wrote about the other seasons too. In this, his work reminds me of Japanese poetry. It is just about possible to rewrite his shorter poems as haiku, making use of their season words. I won't quote the results here, but I did this this myself with 'In the Park' (autumn), 'A Winter Evening'; 'In Spring'; and 'Evening in Lans'. Lans is a village in Austria, but Trakl provides nothing specific in that poem to identify it - the whitewashed arches under which the narrator drinks could really be anywhere. When Trakl names actual locations, like the The Mönchsberg or Hellbrunn Palace, they are 'purely evocative', as Margitt Lehbert says in the introduction to her Anvil Press translations. The Trakl poem I wrote about here last year was called simply 'Landscape'. Trakl's work seems to lend itself to reworking as well as straight translation. An article in Jacket 2 describes two recent examples: Christopher Hawkey's 'writing through' Trakl in Ventrakl, and Daniele Pantano's reordering of lines from his verse in ORAKL. In addition to extracting landscape descriptions and turning poems into haiku, I have contemplated other operations such as arranging Trakl's lines according to colour. Simple colour adjectives are used in almost every poem. From his yellow suns, green forests, blue doves and white poppies it would be easy to assemble an expressionist painting resembling those of contemporaries like Franz Marc. The poems can be searched for one particular colour, noting for example Trakl's red leaves, red deer, fish, wine, dresses, money, breasts and clouds (this last occurs in his famous war poem, 'Grodek'). However, as my list above illustrates, Trakl's places are also haunted by blackness, and in the course of reading him you will encounter black decay, black snow, black wind, black waters, black silence. But, rather than end this post in blackness, I will conclude by quoting some of Trakl's uses of the colour blue. Blue asters in the wind bow low and shiver. Your lips drink the cool of the blue rock-spring. O to dwell in the soulful blue of night. I wrote here a few weeks ago about two of the Tacita Dean exhibitions in London this year; this post is about the third one, 'Landscapes', at the Royal Academy. The first thing that will strike any visitor is the venue itself, the new RA extension, and (if you're my age) a feeling of déjà vu as you realise you're entering what was once the Museum of Mankind. Then, the first room is full of clouds. They were all created on slate, using spray chalk, gouache and charcoal pencil. These obviously stand in the long tradition of artist cloud studies - Cozens, Constable, Stieglitz - but are immediately recognisable as the kind of blackboard drawing she became well known for in the nineties (her Turner Prize nomination was twenty years ago). One cloud triptych is called Bless Our Europe and another Where England? I found myself thinking about the chalk cliffs I wrote about in Frozen Air and the way clouds float freely over national borders. Beside these cloud studies, a whole wall is taken up by one of Dean's large-scale mountain drawings, The Montafon Letter (2017). Here the brief textual annotations, which are a feature of her work in different media, come from the account of a devastating avalanche that took place in 1689. A priest tending to the dying was buried by falling snow, but then unburied when another avalanche struck, and survived. There is a photograph of Tacita Dean working on this, accompanying an interesting Guardian interview prior to the opening of this exhibition. Another mountain scene dominates the second room: Quarantania (2018). This shows a forbidding rock wall under a blood red sky - Mt. Quanrantania is the site in the Judean Desert where the devil is said to have tempted Jesus. The image was constructed by manipulating early photographs and above the desert floor there is a kind of blurred mirage effect. Adrian Searle, in his Guardian review, said that 'it is impossible to do justice' to this film. I know what he means about ZZ Top, although I was thinking more of Warren Ellis from The Bad Seeds. Those eclipse glasses were like the distinctive sun goggles in Herzog's Fata Morgana and the split-screen wandering of Oedipus reminded me of Ori Gersht's film about the last walk of Walter Benjamin, Evaders. The idea of filming in Thebes, Illinois may seem a bit forced, but its old courthouse was a wonderfully atmospheric setting. The whole film is worth seeing just for the way the early evening light falls on its old books and floorboards, and for the view across the river of the sun glowing and setting behind distant trees. I would recommend arriving at the start (there's a showing every hour) and trying to get a front seat. We did, and were engrossed by Antigone from start to finish. Of course Leigh Fermor's 'charmed life' in Greece was facilitated by his partner Joan's private income and loyal, emotional support. He and Craxton also made use of their friend Ghika's house on Hydra (there's a nice photograph of Craxton sketching there on the British Museum's blog post about the exhibition). 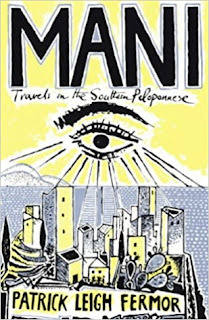 It was on Hydra that Leigh Fermor wrote Mani (1958), his digressive account of a journey round the southernmost tip of the Peloponnese. Here is a passage from my favourite chapter, 'Short Summer Nights'. It describes the unique sharpness of the sunlight in Greece. 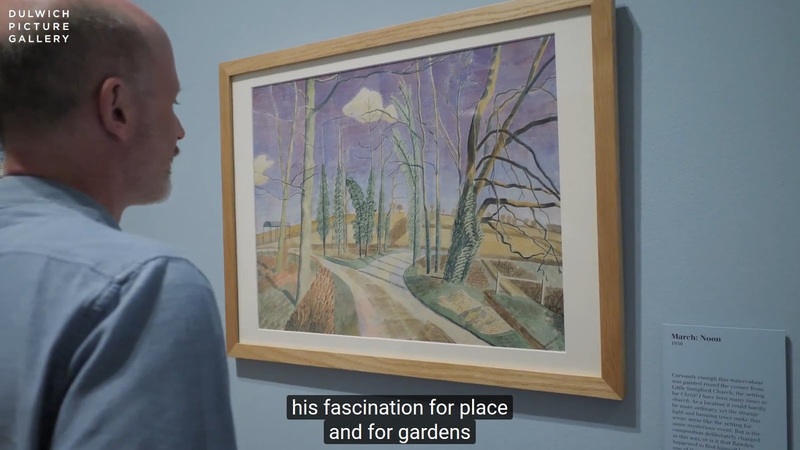 The Dulwich Picture Gallery's Edward Bawden exhibition has a room devoted to 'Spirit of Place'. It includes 'Houses at Ironbridge' (1956/7 owned by the Tate) which is a good example of the way Bawden experimented in his watercolours - the detailed, colourful brickwork might come from the illustration to a children's book but the cloud above is roughly scrawled like something in a contemporary abstract painting. The same year he was elected as a Royal Academician and submitted as his 'Diploma Work' a watercolour of Lindsell Church. This church, near Bawden's home, was also the subject of perhaps the most impressive work in the 'Spirit of Place' room, a large lithograph from 1963. Bawden was generally happy to concentrate on depicting his small corner of Essex, but the exhibition also includes the work he did as a war artist in Italy, North Africa and the Middle East, and a rather striking view of The Canmore Mountain Range (1950), also in the Tate, which was painted on a teaching trip to Canada. In this, the foreground is filled with the gravestones and spiked railings of a Ukrainian cemetery which crowd together and point up to the jagged facets of the mountains, all under a dark grey sky. From the pre-war years the exhibition has some watercolours of Newhaven Harbour, very like those of Bawden's friend Eric Ravilious. They have the same Downland colour palette and the same fascination with mark making - stippling, scratching and washing the paint in various directions. Curiously, the landscape itself seems to tilt down to the right, as if a straight horizon would have made the view look too boring. There is a playfulness and energy in everything Bawden did, even if the results were sometimes rather twee or nostalgic. The gallery obviously thinks the exhibition will appeal to children and (irritatingly) the main painting captions seem to have been written with them in mind. It is, as the review in The Independent points out, easy to compare this exhibition unfavourably to the excellent Ravilious show at Dulwich which I wrote about here three years ago. However, perhaps you can judge for yourself if I end here with an embedded clip of curator James Russell walking through his show. I've also included a screen grab from this above, by way of illustration, as Bawden's actual images are still in copyright. Often have I witnessed the feelings of my fond parent, whilst gazing upon the last gleams of the setting sun, - the deep mellow shades breaking upon the view, 'ere night shed silence and repose upon all earthly things; and often has grey morning, the sweet harbinger of another day, brought vigour and renewed exertion to his enthusiastic and unwearied mind. At length, after many solitary wanderings, and anxious efforts, I became a Picture. Then, again, new fears and anxieties arose. - What was to be thought of me, amongst the thousands of connoisseurs, amateurs, artists, and critics, whom I should be compelled to face? Before leaving A Voice from a Picture I can't resist a digression, to quote an anecdote Gouldsmith includes as an illustration of the straits to which poverty reduces artists. Here a landscape painting is actually worn. Harriet Gouldsmith was painting during the Golden Age of British landscape painting. 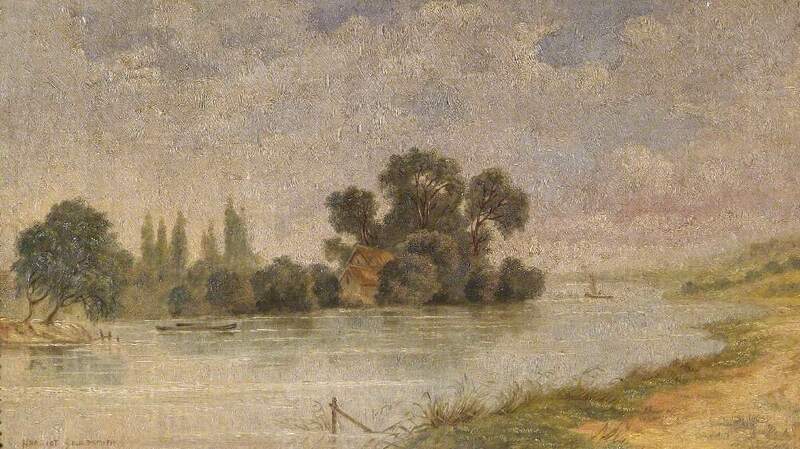 She first exhibited at the RA in 1807 and was elected to the Water Colour Society in 1813. 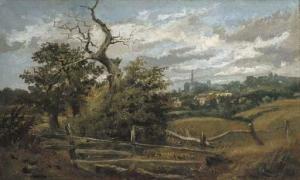 The painting below is a late work and can be found in the Egham Museum, which purchased it in 1985. I wonder how its 'life' played out over the preceding 140 years... Its subject, Magna Carta Island, was itself put up for sale four years ago, with an asking price of £3,950,000 (see the BBC's report). This island includes a Grade II-listed house, built a few years before Gouldsmith's painting, that features a specially-built Charter Room to house the stone on which the charter is supposed to have been signed. Perhaps someone should write A Voice from an Island, to relate the history of its owners since that day in 1215 when Runnymede took its place in the story of England. The Times reported that as a result of the sale, Magna Carta Island has been acquired by a Chinese family. The Public Domain Review is a constant source of fascinating material and I thought I'd share here something I read about there recently, a book called Tokaido Gojusan-eki Hachiyama Edyu. Connecting Edo (now known as Tokyo) to Kyoto, the Tōkaidō road was the most important of the “Five Routes” in Edo-period Japan. 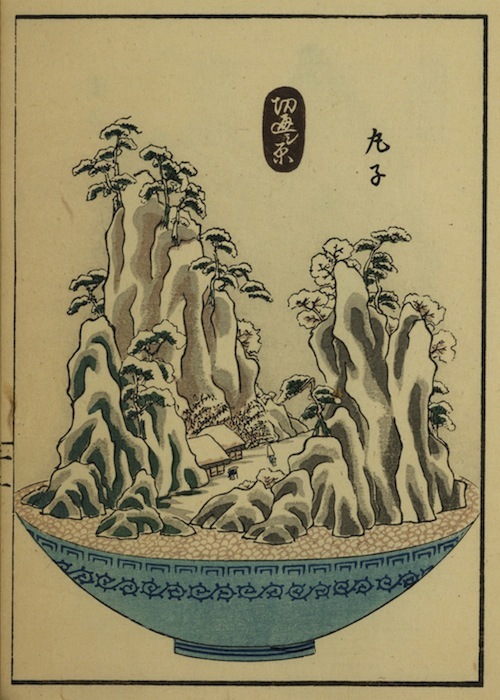 This coastal road and its fifty-three stations has been the subject of both art and literature, perhaps most famously depicted by the Japanese artist Utagawa Hiroshige in his The Fifty-three Stations of the Tōkaidō, a series of ukiyo-e woodcut prints created in the 1830s. 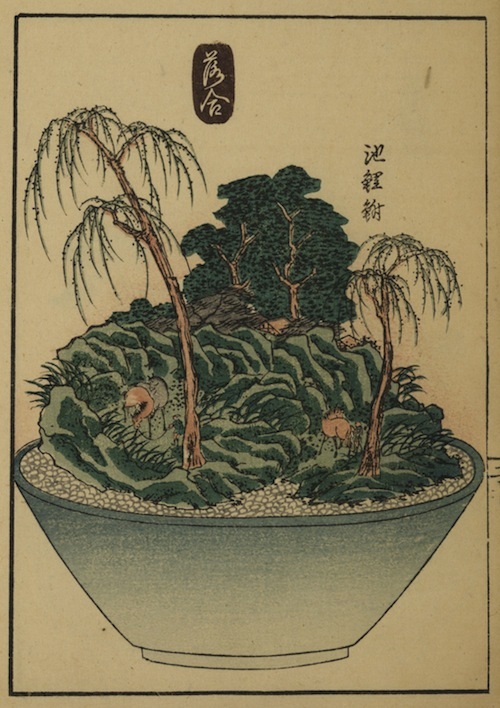 This book from the mid-19th century, Tokaido Gojusan-eki Hachiyama Edyu, presents a series of fifty-three prints created by a relatively obscure ukiyo-e artist named Utagawa Yoshishige, each illustration depicting a Tōkaidō station in the form of a potted landscape. 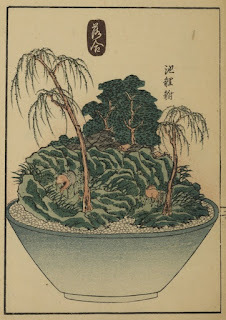 The preface tells us that the illustrations are based on actual pieces constructed by the preface writer’s father, Kimura Tōsen. Creating the models in 1847, a year before publication, Tōsen commissioned Utagawa Yoshishige to make illustrations of each model for a book through which he could share them with the world, and (due to his modesty) asked his son to write the preface. The Public Domain Review article doesn't identify Kimura Tōsen's landscapes, but you can puzzle them out. The image below is clearly a view of Hiratsuka - I have reproduced Hiroshige's version above. The other two examples below are (I think) Chiryū (No. 39, scene of a horse fair) and Kanbara (No. 15, a snow scene). 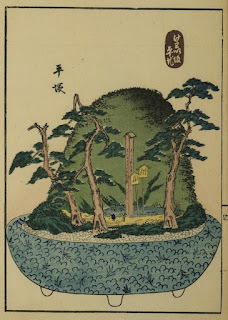 Here landscape has been refracted first through the prints of Hiroshige, then through the tray landscapes of Tōsen and then once again through the medium of print, a trace of a trace of a trace of the views from the Tōkaidō road. 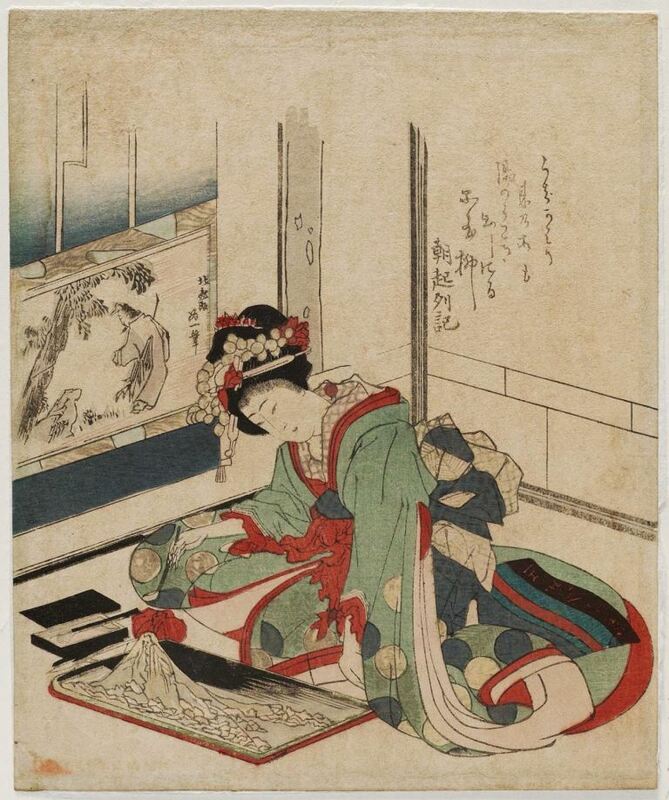 Katsushika Hokusai, Woman making a bonseki mountain, n.d.